Scenic overlook getaway at the base of the Superstition Mountains! Adventure looms within the shadows of a historic Arizona mountain range. Trails amid Sonoran Desert splendor invite visitors to enjoy the absolute beauty of this unique ecosystem. A cabin experience at Lost Dutchman allows park visitors to play hard, and rest easy in air-conditioned comfort. 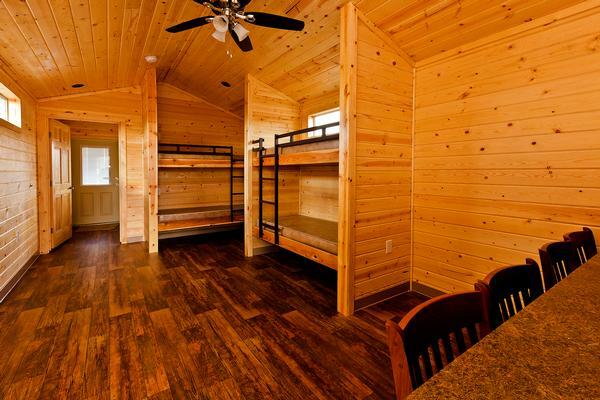 You bring the adventure mindset, we'll provide peace of mind with our rustic new cabins! Cabin reservations at Lost Dutchman State Park are now available online or by calling 1-877-MY-PARKS. We're at your service 7 days a week from 8 am to 5 pm Arizona time. 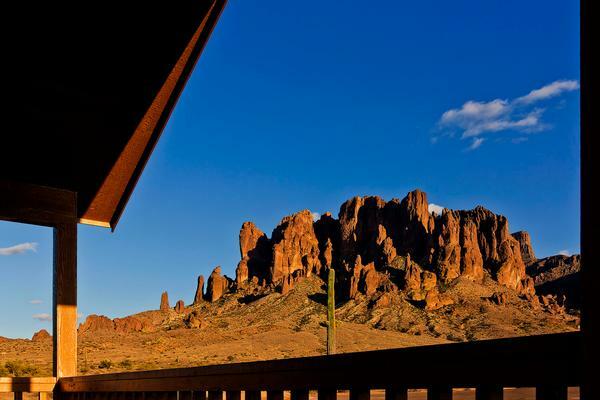 Five two-three room cabins area available with beautiful views of the Superstition Mountains. The cabins make an ideal getaway for a weekend — or a week. The cabins are furnished with a queen-sized bed, two sets of bunk beds, counter and chairs, ceiling fan with overhead light, and electricity. Cabins also have heating and air-conditioning! All of our cabins are wheelchair friendly and accessible to people with disabilities. Each cabin also has a picnic table outside and a fire ring with grill gate. Campers provide their own bedding and pillows. Shower/restroom facilities are a short walk from the cabin area. Cabin Fee: $119 per night, Monday-Sunday. $10 reservation fee. Holiday Rate: $129 per night. $10 reservation fee. Maximum of two vehicles per cabin. Each vehicle must have a permit displayed. Three-night minimum stay on holidays (Martin Luther King, Jr.; President's Day; Easter; Memorial Day; Independence Day; Labor Day; Veteran's Day; Thanksgiving; Christmas). Maximum occupancy is six people, including children and at least one member of the party must be a legal adult (18 years of age). Six people maximum occupancy for adjacent RV sites. Tents are not allowed at the cabin sites or adjacent RV sites. Your cabin access code is the last four digits of your confirmation number. The cabins have beds with mattresses, but no linens. Please bring your own linens or sleeping bags, pillows, etc. Cabins have electricity, lighting, heating and cooling but, no plumbing. Restrooms and showers are located nearby. Dishes can be washed in the sinks behind the restroom building. Smoking and open flames are not permitted in the cabins. A $250.00 cleaning fee will be assessed for failure to adhere to this policy. Cooking is not permitted in the cabins or on the porch. An excessive cleaning fee ($50.00/hour) will be assessed for failure to adhere to this policy. No pets are allowed in the new cabins the first year of operation. If pets are found to be in the new cabins, a $100 cleaning fee will be assessed. Please make sure to leave the cabin clean and undamaged. Failure to do so may result in cleaning/damage fees billed to the credit card on file. All other policies governing Arizona State Parks shall apply. Named after the fabled lost gold mine, Lost Dutchman State Park is located in the Sonoran Desert, 40 miles east of Phoenix. Several trails lead from the park into the Superstition Wilderness and surrounding Tonto National Forest. Take a stroll along the Native Plant Trail or hike the challenging Siphon Draw Trail to the top of the Flatiron. Depending on the year’s rainfall, you might be treated to a carpet of desert wildflowers in the spring. Enjoy a weekend of camping and experience native wildlife including mule deer, coyote, javelina and jackrabbit. A four mile mountain bike loop trail has opened at the park – this is a great way to enjoy the park's beauty!